In any hobby when you are keyed in there will be “the one that got away”. For me, I scrapbooked like I meant if for most of my teenage years, even working in the small town drug store that not only carried scrapbooking supplies, but had a large selection of Christian books alongside the normal drugstore gifts and novelties. College and the early years of my marriage were dedicated to other hobbies, and I didn’t come back to scrapbooking until after my son was born, when I found Project Life and finished his first year album in less than a week. Half way into the second year I discovered some online community (and that Two Peas was gone *sob*) at Studio Calico. I am a pretty shy forum user, I prefer to lurk, but soon I was subscribing and I think I killed my first kit in one sit down, going back and adding embellishments through pages I had already done and I had even commented on a few threads. I loved a kit, then disliked the next one, loved the kit after that and all the while started realizing what was out there. 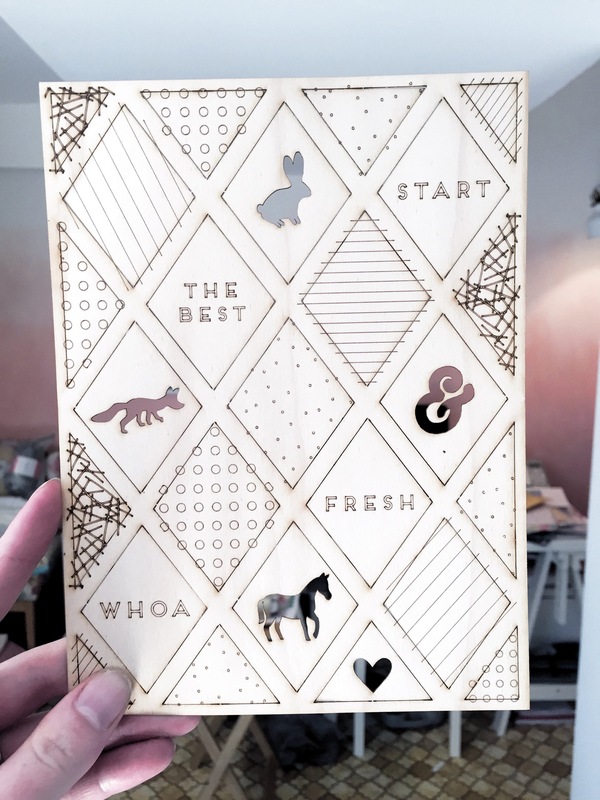 That first few months the only thing I really had to have was something unavailable, the wood veneer diamonds from the Far Far Away scrapbook kit. The kit had sold out during the month and I hadn’t even realized it was there! For most of the year I kept an eye on the Project life Swap and Shop Facebook group, but my white unicorn never appeared or was willing to ship to Canada. Last month a fellow (extremely kind) user alerted me as soon as the “found” kits were in the shop ( for pennies… Pennies I tell you!) and let me tell you I had no control over these beauties jumping into my cart. Now to the eternal question, once you have the thing you desire can you use it on a project or be paralyzed by the fear of messing it up 😳? Let me know if you’ve ever experienced the thrill of finding your white unicorn and did you have the guts to use it in a layout or page. I’m dying to know. I have to admit to never being worried about using the stash I love, they’ll always be something new I love around the corner. You are so right Michelle! It always goes that way. Sometimes hard to remember I the moment! I can’t think of a specific ‘white unicorn’…but admit I do tend to hoard papers that I love and cannot seem to cut into them. I’ve done the same in the past. I will say I cut into a few favorite black and whites for my DITL and I certainly don’t regret it, sometimes you just need the right project. I have a few papers that I struggle to cut up or cover because they are so pretty. Paper is hard. Sometimes it only looks good big and adding other pieces or making it smaller changes the effect. My white unicorn was the studio calico wood veneer stars. They were impossible to find. My awesome husband found them and bought 5 packages. That’s over a thousand stars! Haha. That’s so great. Husbands are the best! I see a lot of things in British paper craft magazines that I think I want. Most I never find. I did find Indigo Blu’s mega flake glitter and some of their stamps. I’ve used it on a few cards so far, but probably not enough to justify the expense. So far anyway. That’s tricky when it comes from so far away. I don’t ever really worry about messing up my lucky finds. I figure there will always be more! (Though, Twine and Ink puffys are my favorite thing to hoard. Haha I struggle with them so much. Do you want some more of the stars and dots from homespun?? Send me your address and I’ll send you some happy mail! Amyjosipad at gmail dot com.